Once the rough plumbing has been installed in the bathroom, it's time for the bathtub to be placed. Do it yourself to save time and money on your bathroom installation. Alcove tubs have an apron front and are inserted between two walls. They are most commonly used in tub and shower installations and are the easiest to install. Drop-in and undermount tubs both require a tub deck to be built for them before they are installed. The drop-in tub is lowered down into the finished deck - which includes all tile and finishing materials to be placed first, while the undermount tub is lowered into an unfinished box and a slab deck is placed on top. Alcove bathtubs are the fastest to install. Just make sure the rough plumbing has been installed first, and that the unfinished walls measure 1-inch larger than the tub itself; tile or a tub surround will fill in the remaining space. Measure the tub from beneath the back edge on the unfinished side of the tub to the floor. Mark this height on the back wall of the tub enclosure and screw a row of 2 x 4 boards onto the studs at this height. This will support the back of the tub and help keep it level. Turn the tub so the apron faces out toward you and the overflow and drain match up with the wet, or plumbing, wall. Carefully maneuver the tub into place so the back edge of the tub sits flush against the studs, resting on the support ledge. Screw the tub's flange, located below the back of the unfinished tub area, into the wall studs. Look to the side of the tub where the drain is located and place the back piece of the drain and overflow, connecting it to the rough plumbing. Screw in the face plate on the overflow, and install the drain piece. 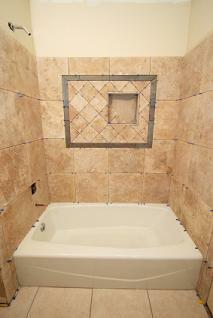 Tile or apply the tub surround as desired. All drop-in and undermount tubs come with a paper template. This template will give you the exact dimensions of the surround box that it will be installed in. It will also give you a pattern to trace. Use this pattern to cut the plywood on the top of the deck to the correct opening for drop-in tubs, or hand it over to the slab manufacturer for the undermount tub installation. If the installation is drop-in, tile the top of the surround first, leaving yourself access to install the overflow. If this is an undermount installation, leave the surround bare, install the tub, then have the fabricators install the top. These instructions are for installing the tub once the deck has been built to the manufacturer's requirements. Fill the base of the surround with a crushed mortar bed that is approximately 2-inches deep. Lift the tub into the surround. If this is a drop-in installation, lower it through the cutout in the top of the surround. If this is an undermount installation, place it in the open surround. Stop up the drain and overflow holes with plastic or rags. Fill the tub with water to help it achieve the correct weight and settle into the mortar bed. Run a bead of silicone around the rim of the drop-in tub to help secure it into place. Do not silicone the undermount tub into place. Drain the tub and hook up the drain and overflow and any tub deck mounted plumbing. Have the fabricator install the slab on the undermount tub. Always double check your measurements. You don't want to get your new bathtub home and find that it doesn't fit in the opening. Follow the manufacturer's instructions for your particular bath tub model closely. If something should go wrong, warranties will only cover damages if you followed the manufacturer's instructions exactly and used their recommended products. Be sure to use silicone caulking that is specifically designed for kitchens and bathrooms. Other types of caulking may break down, resulting in water seepage and wall or flooring damage. Adhere to local building codes and restrictions. Be sure to check with your local building code ordinances regarding proximities of toilets and electrical outlets relative to the bathtub.